Join us on Saturday, June 25th from 7-8:30pm in Shelter Cove Community Park for a free performance by The Army Ground Forces Band. The Army Ground Forces Band performs numerous concerts in support of local, regional and national events, such as centennial celebrations, festivals, inaugurations, and both city and state commemorations. The Band’s various ensembles frequently travel throughout the country, performing several concert tours each year. Click Here to RSVP on our Facebook Event Page! The Army Ground Forces Band provides world-class music in support of the U.S. Army Forces Command, headquartered at Ft. Bragg in Fayetteville, N.C. It serves as the musical ambassador of the American Combat Soldier to the American people, instilling pride in our troops and promoting a spirit of patriotism and support for our nation’s military through the performance of music at the local, regional and national levels. The Army Ground Forces Band was organized as the Fourth Infantry Regiment Band on July 21, 1845 in New Orleans, LA. Its heritage includes twenty-six campaign streamers and the French Croix de Guerre with Gilt Star. The history of this unique band began with the Mexican War, where its members fought heroically, becoming the only Army band to receive a combat distinction from the President of the United States. On September 21, 1846 during the Battle of Monterrey, members of the band captured an enemy artillery battery and turned it against the Mexican army. In recognition of this heroic action, President Zachary Taylor, who had commanded the Fourth Infantry Regiment during the war, authorized the band to wear red piping on its dress uniforms, commemorating its distinguished wartime service. The Army Ground Forces Band’s history includes service in the Civil War, the War with Spain, the Philippine Insurrection, and both World Wars. The band fought with the victorious Third Division, which spearheaded the Battle of the Marne in July of 1918. During World War II, the band participated in the Aleutian Islands operation of May, 1943. Since 1945, this proud organization has been stationed at Fort Lewis, WA; Fort Hood, TX; Fort Meade, MD; Fort Richardson, AK; and Fort McPherson, GA. Following World War II, the name of the Fourth Infantry Regiment Band was changed to its current title, the 214th Army Band. In 1985, Secretary of the Army John O. Marsh Jr. conferred upon the unit the distinctive designation The Army Ground Forces Band. 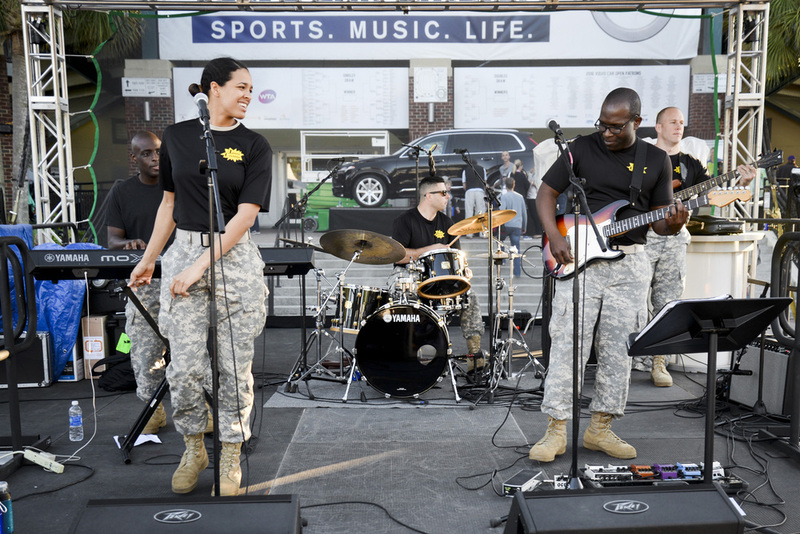 Since that time, the Army Ground Forces Band has served as the Musical Ambassador of the American Combat Soldier, serving as an outreach asset for the United States Army Forces Command, headquartered at Fort Bragg, N.C.